Has Apple i-brainwashed your child? If you think it hasn’t, think again. Apple has successfully taken over children’s life. From an answer sheet, 6 out of 10 words are related to Apple products. And the kids are not left behind as one of the answers is iCloud (unveiled by the late Steve Jobs in June 2011). Maybe you think this is an exaggeration. You wouldn’t argue with me if I say that children as young as two are using iPad. And if that is not enough, I always spot iPad (or iPhone) being the modern day nanny and it makes great dinner companion too. The kids live in their own world and there is little interaction going on at the dinner table. This is just the tip of an iceberg that Apple is penetrating every level of our lives. Now, before you accuse me of being old-fashioned and someone who refuses to accept modern technology, I hereby declare that I am not against Apple and any tech gadgets for that matter. The gadget is not without its benefits. What concerns me is tools are still tools and they are invented to make our life easier and more productive. And how productive could that be if your child remains silent and busy tapping the screen of the iPad while having dinner with family and friends? 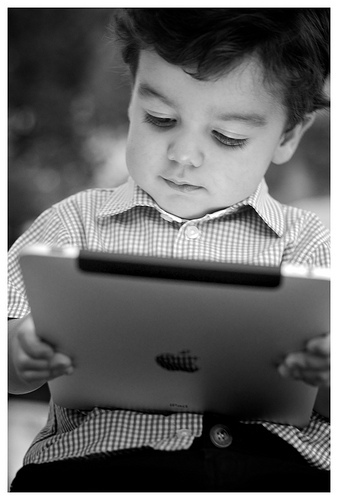 How does it make your child’s life easier if his head is full of vocabulary of Apple products? This calls for a serious thought on the usage of high tech gadgets. I don’t agree if you let your child hold on to the iPad 24/7. As if that your child works as a customer support for a mission critical company. No matter what, here’s the bottom line: Don’t let modern technology take over your child’s life. There’s more to life than Apple (or any other gadget). When you are into it, you keep chasing the latest models. You want to get the new shiny gadget as soon as they launch. You are teaching your child that buying products is the way of life. We all know that this is not a healthy trend and consumer debt is the largest factor that contributes to bankruptcy. Cut this out and teach your child prudence spending before it’s too late. Happiness should be internally-driven and should not be dependent on what gadget you have.